Having spent my entire life in the South of England, the phenomenon of Greggs only presented itself to me in the past few years, having had a Greggs-deprived childhood, with only Forfars attempting to fill the vacuous void in my chain bakery desire. Luckily I have witnessed the opening of five of these bakers in my hometowns in Kent &amp; Sussex in recent times, which means the entirety of my Greggs experience has taken places in my 20s. No childhood nostalgia here. 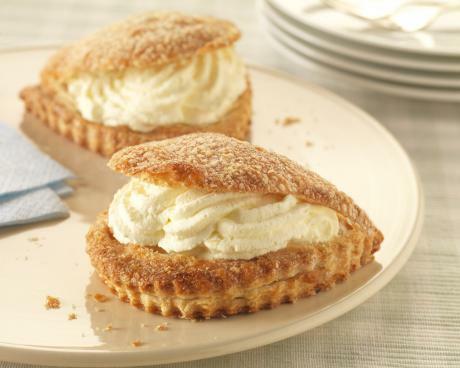 Nevertheless, the slightly awkwardly named Cream Apple Turnover is genuinely delicious. It is a bit of saucy apple lathered in ‘squirty cream’, folded delicately in some pleasantly flaky sugared pastry. The turnover boffins at Greggs have clearly done their maths; the ratio of pastry to apple to cream is sublime, with no particular element overshadowing the others, yet the subtleties of the cubed citrus delights and intricacies of the sweet dairy foam are equally present for the eager eater to appreciate. It is a somewhat messy dish, so be careful to use the bag to double up as a kind of impromptu bib so as to avoid an embarrassing flaky incident on the bus home. The worst part of the treat are the three corners of the Isosceles snack, as the pastry is very thick there and is overwhelming of the turnover’s contents, though it is understandably in order to seal the innards from oozing out. Although I can see why the eggheads at Greggs took this practical course of action when they designed the Cream Apple Turnover, it still makes for a very bland, pastry-heavy end to an otherwise delicious dessert. Be sure to eat the corners early so your last mouthful is not a disappointing one.